This is one of my favorite salads from the grocery deli counter. I don't buy it very often, but enjoy it at potlucks and other events when other people buy it and bring it! 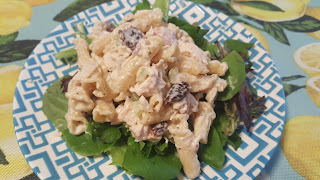 So I couldn't have been more thrilled when Lund's and Byerly's released the RECIPE for this salad. I knew from eating it that it wasn't complicated, but I couldn't really place the dressing. Now that I see the recipe, I feel kind of silly. It's so exceedingly simple, that dressing - just prepared poppyseed dressing and mayo! Although late September is an odd time to be making pasta salad, the 87 degree weather makes it possible - it's just not beef stew time yet, is it? So if you need a simple lunch or dinner, or want to be the envy of everyone at the next potluck - make this salad! It's really delicious. Find more great ideas at Inspiration Monday, Mix it Up, Busy Monday, Inspire Me, Inspire Me 2, Full Plate, Wonderful Wednesday, Foodie Friday, Weekend Potluck, Awesome Friday. Cook pasta in boiling salted water according to package directions. Rinse with cold water; drain. In a large bowl, combine chicken, pasta, celery, onion and cherries. In a large measuring cup, combine mayonnaise, poppy seed dressing, salt and pepper. Fold 1 cup of dressing into salad, reserving the rest. Refrigerate the salad, covered, several hours or overnight. To serve, add remaining dressing as needed. Serve on a bed of your favorite greens. 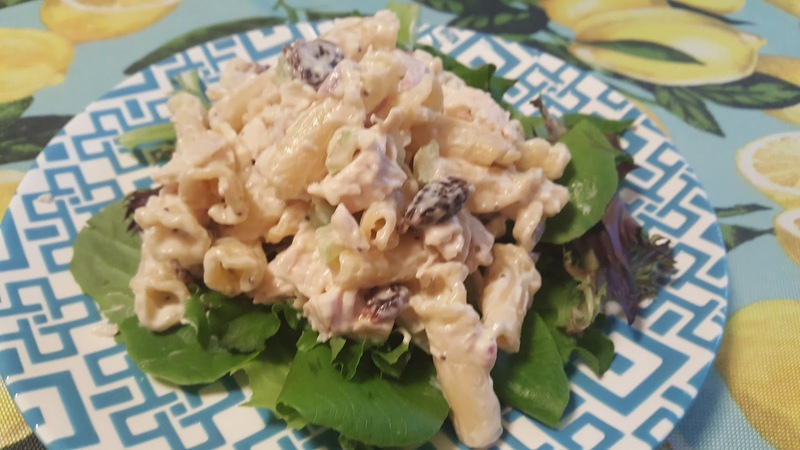 Your Cherry Chicken Pasta Salad looks delicious. I love the combination of ingredients that you used for the salad. Thanks so much for sharing your awesome post with us at Full Plate Thursday and come back soon!